Directions: Slightly heat vieeny can. Pour off or drink excess juice. Dig out first sausage with knife, stick, or finger. Serve with cold beer. Place Vieenys on a stick. Hold over fire until warm. Remove all flamable material from immediate area. Place on ground, light fuse, get away. Rotate slowly over smoke bomb. 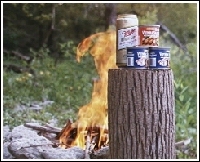 Leave Vienna Sausage whole or cut in half as desired. Combine remaining ingredients; mix lightly. Turn 1/2 rice mixture into greased casserole; spread sausages on rice. Add rice to fill casserole; top with remaining sausages and dot with butter. Bake in moderate oven (350° F.) 25 minutes. Makes 4-6 servings. Alternate vieenys and marshmallows on stick. Roast over open fire until done. Ingredient List: Mechanically separated chicken, pork, water, salt, corn syrup, hydrolyzed soy and potato protein, dextrose, hydrolyzed casein and whey protein, flavoring, sodium erythorbate, sodium nitrate. Nutrition Facts: Serving size 1 can - Total fat 30g, Cholest. 90mg, Sodium 840mg, Calories 320. 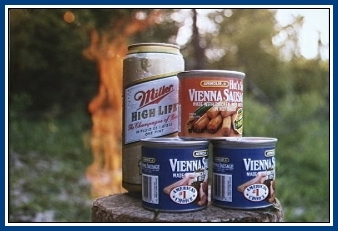 Production Process: The primary raw ingredients in Vienna Sausage are pork, beef and chicken. The ingredients are pre-ground into large chunks, and then all the meats are blended together and analyzed for fat content. Once the proper fat content has been established, the spices and the water are added and mixed thoroughly. This mixture is then emulsified to a pancake-type batter and stuffed into a casing. The casing serves as a mold to shape the wiener while it is being cooked. In the smokehouse, the outside edge of the wiener has a pliable skin formed by the cooking. Once the product is chilled, the casing is removed and conveyed to the Vienna Sausage packing machine. Seven strands of wieners 10 meters long are placed in the cup of the Marten Vienna packer. The seven strands represent twelve cans of Vienna Sausage. The strands are cut into proper lengths and then stuffed into the can. Each can is inspected for quality before the broth is added and the lid applied. Once the chilled can leaves the closing machine (it is checked immediately!) for vacuum, returned to a shelf- stable state, checked again for vacuum, labeled, and packed into a carton. Vienna Sausage Labels - Libby's, Hormel, Armour, they're all here! Vienna Sausage Hat - "#37 Fleece body with contrasting sausages"
Armour Star Canned Meats - Here's the financial report for those interested in investing. Send your vieeny recipes to TrailZZone! Free home pages and e-mail!